família multi-racial e multi-atributo que tem suporte em fusion mechanics (contact fusion: modalidade de fusão que dispensa carta de fusão e aonde ambos materiais tem de estar em campo). Curiosamente nenhum dos seus membros possue qualquer habilidade relacionada a busca de outros membros ou de cartas de suporte pra sua mecânica de extra deck. Já os neo fusion monstros possuem diversas peculiaridades que afeta grandemente a sua jogabildade tais como: são todas NOMI monstros; um dos materiais é sempre E-hero neos (o que criava certa dificuldade porque era necessário ter neo em campos, sendo este um lv7 monstro) e a pior de todas no fim do turno eles retornam automaticamente pro extra deck. You can only use each effect of this card’s name once per turn. 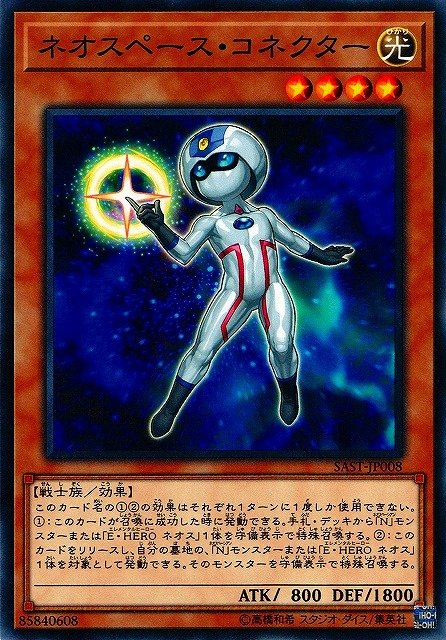 (1) When this card is Normal Summoned: You can Special Summon 1 “Neo-Spacian” monster or 1 “Elemental HERO Neos” from your hand or Deck in Defense Position. 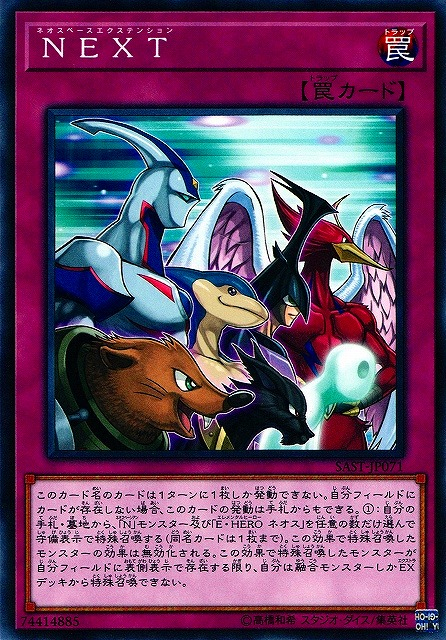 (2) You can Tribute this card, then target 1 “Neo-Spacian” monster or 1 “Elemental HERO Neos” in your GY; Special Summon that target in Defense Position. comentários: possui 2 habilidades: ele tem um trguer efeito acionado pelo summon de invocar neos ou um neospacian do deck ou da mao. E tem um ignition efeito (este com custo) de invocar um neos ou neospacian do cemitério. EXCELENTE! Must be Fusion Summoned. 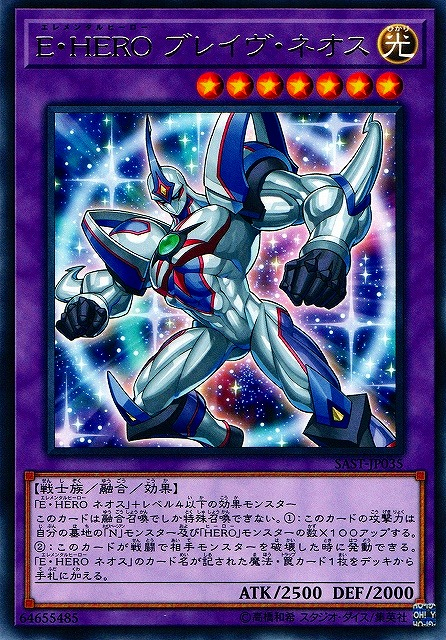 (1) Gains 100 ATK for each “Neo-Spacian” and “HERO” monster in your GY. (2) When this card destroys a monster by battle: You can add 1 Spell/Trap Card that specifically lists the card name “Elemental HERO Neos” from your Deck to your hand. Must first be Special Summoned by shuffling the above cards you control into the Deck (you do not use “Polymerization”). (1) If this card is Special Summoned from the Extra Deck: You can activate this effect; your opponent cannot activate effects on the field for the rest of this turn. Your opponent cannot activate cards or effects in response to this effect’s activation. (2) Once per turn, during the End Phase: Shuffle this card into the Deck, and if you do, destroy all cards your opponent controls. 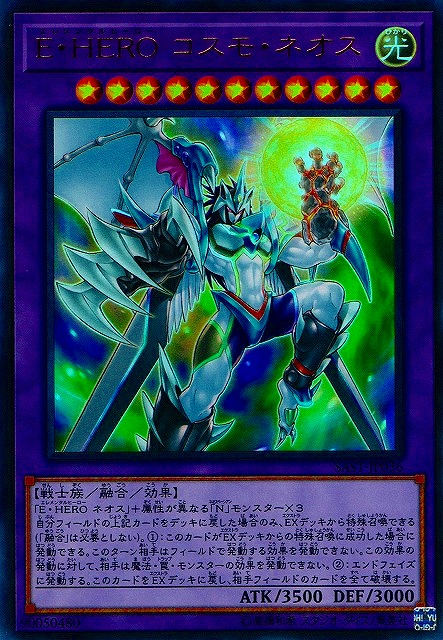 (1) Special Summon from the Extra Deck 1 Fusion Monster that lists exactly 2 Fusion Materials, including “Elemental HERO Neos”, by sending its Fusion Materials from your hand, Deck, or field to the GY, ignoring its Summoning conditions, also you cannot Special Summon for the rest of this turn. 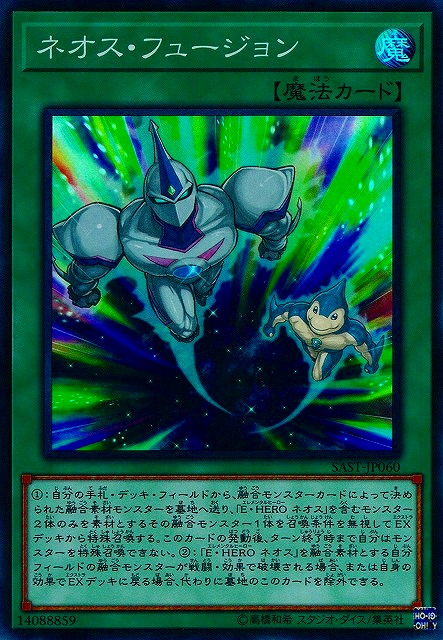 (2) If a monster you control that lists “Elemental HERO Neos” as a Fusion Material would be destroyed by battle or card effect, or returned to the Extra Deck by its own effect, you can banish this card from your GY instead.